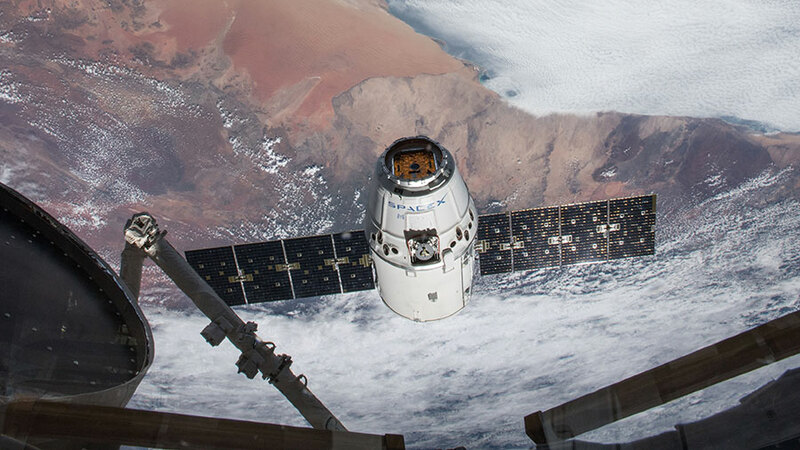 The SpaceX Dragon resupply ship approaches the International Space Station before its capture on April 4, 2018 as both spacecraft begin an orbital pass off the southern coast of Namibia then northwest across the continent of Africa. The crew on board the International Space Station has been busy this month unloading the bounty of supplies and equipment brought up by the SpaceX Dragon and repacking it with cargo to be returned to Earth. If you’ve ever wondered what goes into a layover at the space station, check out chapter 14 of the new NASA ebook, The International Space Station: Operating an Outpost in the New Frontier. The book, which was written by space station flight directors, is now available to download for free at https://go.usa.gov/xQbvH. Here’s an excerpt from Chapter 14: Vital Visiting Vehicles – Keeping the Remote Outpost Crewed and Operating. On Earth, a person’s typical week might consist of a trip to the grocery store, several trips to the local home improvement store, taking out the trash and recyclables, and doing a few loads of laundry. If something is broken in the home, a replacement part is ordered and the homeowner must wait for a delivery. Or, he or she might need to schedule a professional to make the repair. Homeowners probably do not think about the water supply. They definitely do not worry about the supply of oxygen needed to breathe or the removal of carbon dioxide that is expelled from the human body. The International Space Station (ISS) is a unique, world-class orbiting laboratory. 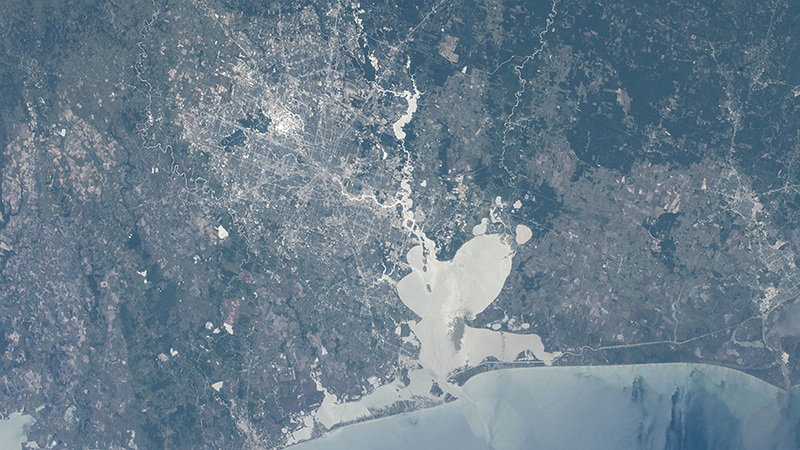 It is also home to astronauts and cosmonauts. The logistics of keeping such a home running are complicated. In space, there are no grocery stores or home improvements stores. The “trash truck” only comes around every few months. Washers and dryers for clothing do not exist, and access to clean attire can take months. Much of the breathable air and drinkable water must be delivered. When supplies (e.g., bathroom tissue) are low, crew members cannot tap a few keys on the computer and wait for resupplies to arrive at the door. They call Mission Control and place their order, and then they wait. Moving astronauts and cosmonauts, science experiments, food, water, air, spare parts, and other supplies to and from the ISS is a highly choreographed international operation that must be executed with near perfection, every time. Such an effort requires more than one spacecraft. This was never more evident than in an 8-month span between October 2014 and June 2015 when three different resupply missions were lost during or shortly after launch. Three different rockets from three different companies experienced three different failures. According to statistics, this scenario was supposed to be nearly impossible. Yet, it happened. Operations on board the ISS continued despite the lack of resupply. So, exactly what does it take to keep the ISS resupplied? It starts with a procession of vehicles from around the world that visit the ISS. Author Mark GarciaPosted on April 30, 2018 April 30, 2018 Categories Expedition 55Tags dragon, International Space Station, NASA, science, spacex2 Comments on What Does It Take to Keep the Station Stocked With Supplies? 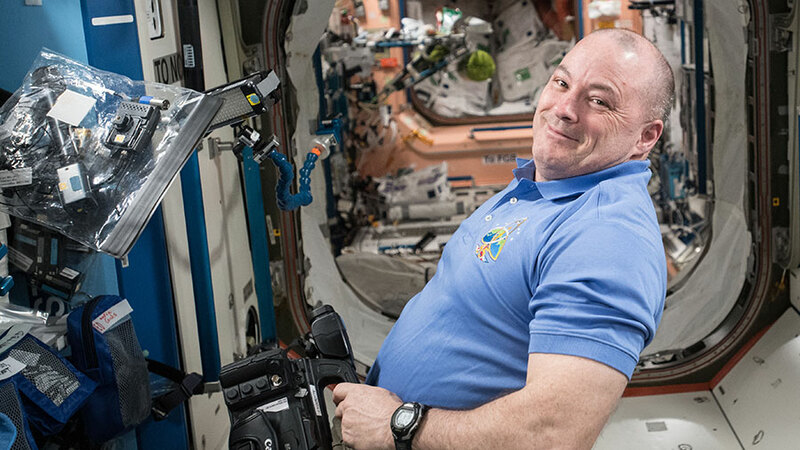 NASA astronaut Scott Tingle prepares video equipment for a series of education videos being recorded for the STEMonstration campaign which demonstrates scientific concepts in space for students and teachers. A wide variety of life science is being explored today aboard the International Space Station as Expedition 55 crew members prepare for a spacewalk planned for next month. The space residents also continued the upkeep of the orbital lab while robotics controllers set up an external experiment. Japanese astronaut Norishige Kanai split his time today between tending mice and removing sensors attached to his arm. The rodents are being observed to detect the chemical signals that lead to muscle and bone loss in space and to provide therapies to keep astronauts healthy. Kanai also removed an armband monitor and sensors he wore for 36 hours that recorded alterations in his circadian rhythm caused by living in space. 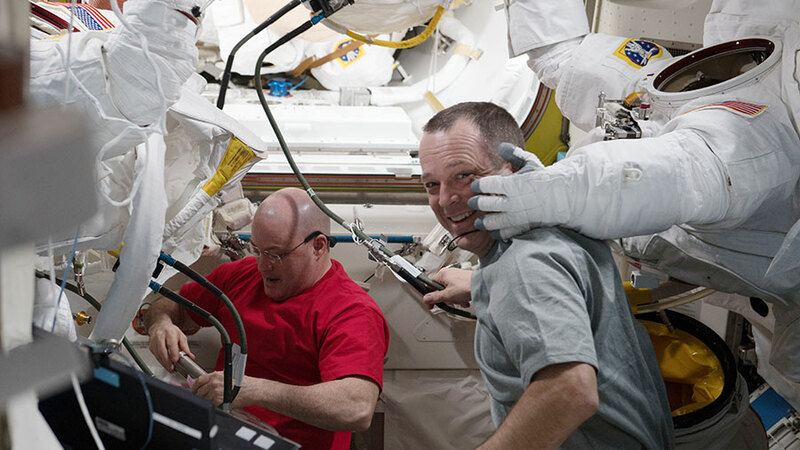 Flight Engineers Ricky Arnold and Drew Feustel are getting ready for a May 16 spacewalk to swap out thermal control gear that circulates ammonia to keep station systems cool. The duo readied their spacewalk tools today then dumped water and purged gases from a pair of U.S. spacesuits. Scott Tingle of NASA worked inside the Harmony module today to replace a deteriorating Pump Package Assembly (PPA) with a spare device. The PPA is a thermal control system that provides water cooling to station payloads and critical systems avionics. Science is also taking place outside the space station and robotics controllers are working to transfer a tray for the materials exposure experiment (MISSE-FF) outside of the Kibo lab module through the lab’s airlock for reconfiguration tomorrow. The complex robotic maneuvers are remotely controlled from the ground and use not only the Canadarm2 robotic arm but also the fine-tuning robotic hand known as Dextre. MISSE-FF will test materials, coatings, and components in the harsh environment of space. Also, overnight, Russian flight controllers sent commands to deorbit the unpiloted ISS Progress 68 cargo craft that had been orbiting for the past month for engineering test following its undocking from the station March 28. It burned up harmlessly in the Earth’s atmosphere over the southern Pacific. Astronauts Scott Tingle (left) and Ricky Arnold wrap up spacesuit work following a successful spacewalk on March 29, 2018. The duo scrubbed cooling loops, performed the iodination of ion filters and tested the water conductivity inside a pair of U.S. spacesuits. The Expedition 55 crew is experimenting with space gardening today while packing research samples and cargo for return to Earth. The space residents are also breaking down gear brought in from last month’s spacewalk and getting ready for the next spacewalk. Botany research aboard the International Space Station helps scientists and astronauts learn how to grow food off Earth to sustain future missions. Today’s space gardening work performed by Flight Engineer Drew Feustel will test the automated nourishment of lettuce and mizuna greens grown in the Veggie facility. The plants will be harvested and samples sent back to Earth for analysis. Botanical samples are just one example of the multiple types of research and cargo that is sent to Earth packed inside the SpaceX Dragon cargo craft. Radiation monitors that recorded exposure levels in the station’s crew quarters were collected by Japanese astronaut Norishige Kanai today for stowage inside Dragon. Engineers on the ground will examine the radiation data and determine the exposure risk to the crew and develop countermeasures. NASA astronauts Scott Tingle and Ricky Arnold disassembled an external television camera group (ETVCG) brought in from last month’s spacewalk. Tingle then replaced a failed light bulb in a light to be used on another ETVCG which will be installed on the next spacewalk scheduled for mid-May. Parts from the old ETVCG will be shipped back to Earth in Dragon for refurbishment. Dragon is due for two more work days of packing before its return to Earth next week. Ground controllers will remotely detach Dragon from the Harmony module before releasing it from the grips of Canadarm2 into space at 10:22 a.m. EDT Wednesday, May 2. Tingle will monitor the robotics activities as NASA TV broadcasts the departure activities live starting at 10 a.m. Splashdown in the Pacific Ocean is planned for 4:02 p.m. and will not be seen on NASA TV. 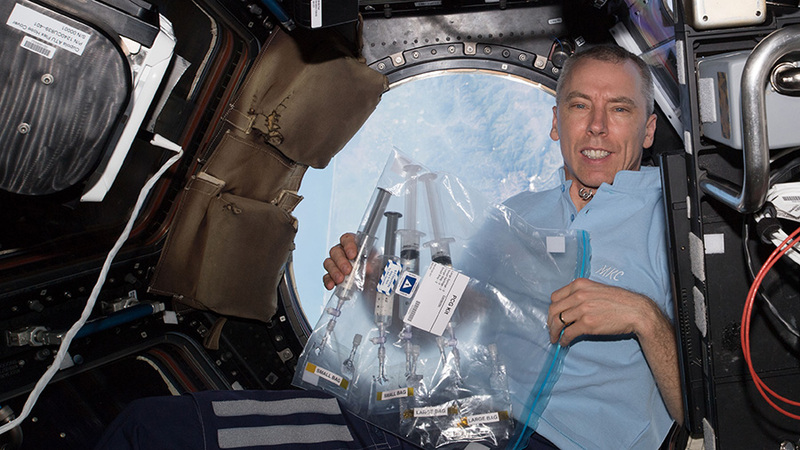 NASA astronaut Drew Feustel conducts science operations using the Multi-Use Variable-G Platform that enables research into smaller and microscopic organisms. 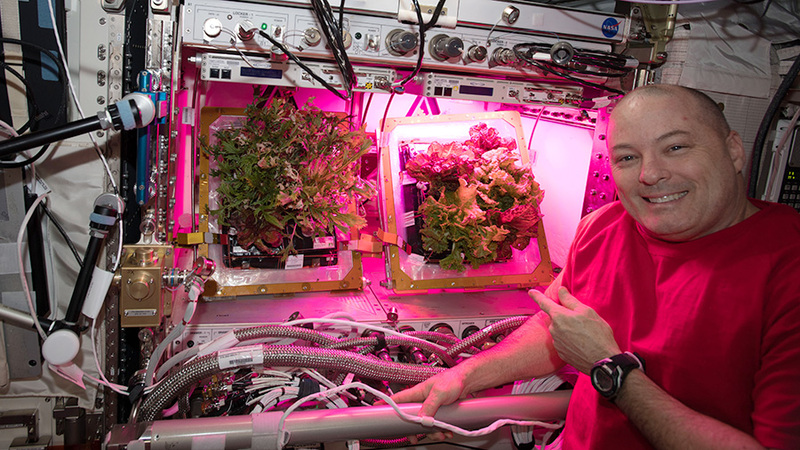 NASA astronaut Scott Tingle tends to plants grown inside the VEGGIE facility in support of space botany research. The outside of the International Space Station is a harsh environment but scientists are taking advantage of the extreme conditions to conduct advanced space research. Astronauts are also researching what happens to a variety of organisms living for months at a time inside a spacecraft as NASA prepares for longer missions farther out into space. The fifth and final external materials experiment (MISSE) delivered by the latest SpaceX Dragon resupply ship was activated outside the orbital lab today. Robotics engineers operating the Canadarm2 and Dextre extracted and installed the MISSE canisters one by one from Dragon’s trunk to areas on the station. The canisters were then remotely opened exposing a variety of materials to the vacuum of space to help engineers design safer and stronger spacecraft systems. Back inside the orbital lab, Flight Engineer Scott Tingle of NASA harvested and photographed plants for the APEX-06 study today. The botanical samples collected from the VEGGIE facility were later processed and stowed in a science freezer for return to Earth inside the Dragon cargo craft. They will be analyzed after being quickly shipped to scientists at NASA and the University of Wisconsin. NASA Flight Engineers Ricky Arnold and Drew Feustel once again partnered up and collected their blood and urine samples today for more biomedical experiments. Researchers are analyzing the samples as they continuously study how the human body adapts to extended periods of weightlessness. Results will help doctors provide therapies to maintain the health of astronauts in space and humans on Earth. Mice are also being observed on the space station so scientists can detect the chemical signals that lead to weakened bones and muscles. Japanese astronaut Norishige Kanai drew more blood samples from the rodents today and wrapped up a week-long run of the Mouse Stress Defense experiment. The blood samples will be processed in a centrifuge, stowed in biological science freezer then returned to Earth inside Dragon for analysis on Earth. 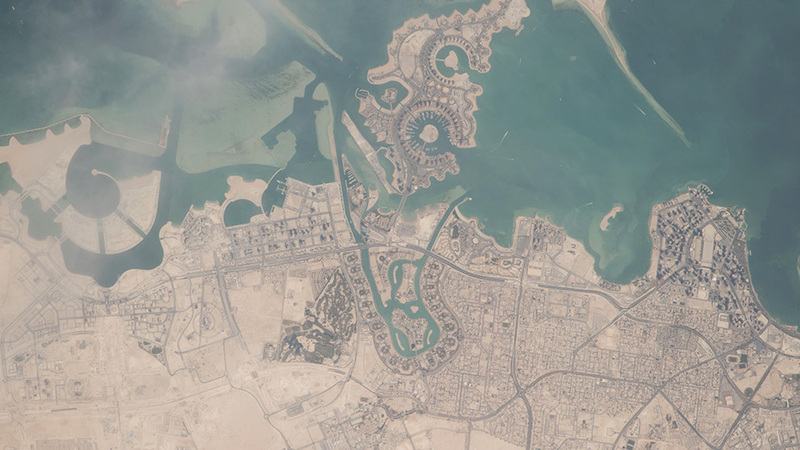 Doha, the capital city of Qatar, was photographed as the space station orbited over the northeastern coast of the Arabian Peninsula. Biomedical research to improve health on Earth and in space dominated today’s science activities aboard the International Space Station. The Expedition 55 crew is helping scientists from around the world understand how life shaped by gravity adapts to living in outer space. 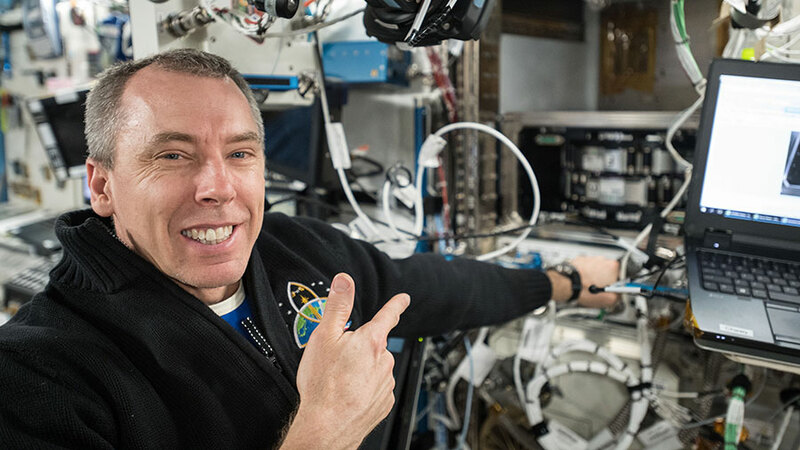 NASA astronauts Ricky Arnold and Drew Feustel joined forces today collecting and stowing their blood samples in a science freezer for a pair of human research studies. The samples will be analyzed later to detect the chemical responses and physiological changes that take place in the human body during a spaceflight mission. Blood samples were also drawn from mice as Japanese astronaut Norishige Kanai continued his week-long research activities for the Mouse Stress Defense experiment. Those samples will be processed in centrifuge, stowed in a freezer then analyzed to detect the processes that lead to muscle and bone loss in microgravity. Astronauts could benefit from the results and stay healthier on longer missions farther into space. Exercise is a very important contributor to maintaining stronger bones and muscles in space. However, exercise devices are bulky and can impact spacecraft habitability. Arnold tested a newer, smaller device today called the Miniature Exercise Device-2 that provides a range of motion and resistance workouts while maximizing habitable spacecraft volume. 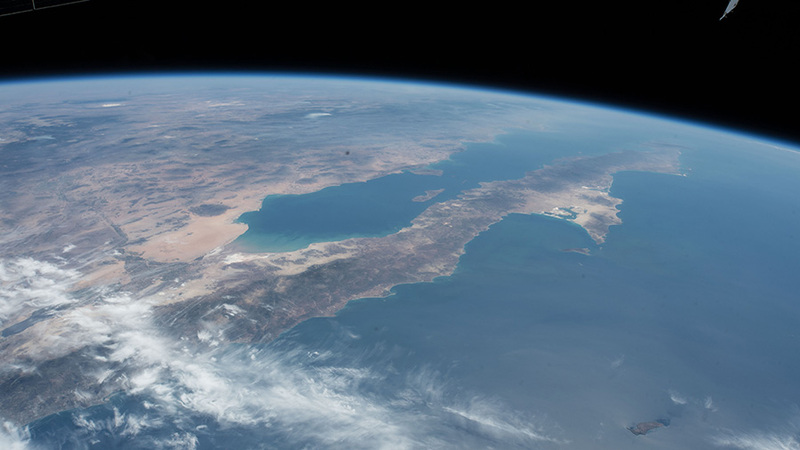 Mexico, Baja California and the southern coast of the state of California are pictured as the International Space Station orbited above the Pacific Ocean. Russia’s Progress 69 resupply ship docked to the Zvezda service module fired its thrusters boosting the station’s orbit today. The two-minute, six-second burn establishes the correct orbit when three crew members undock and land in June and a two-orbit rendezvous capability for the Progress 70P resupply craft when it launches in July. NASA crewmates Scott Tingle, Ricky Arnold and Drew Feustel became lab assistants today as they collected and stowed their own blood, urine and saliva samples in a science freezer. Two long-running human research experiments, Biochemical Profile and Repository, are basing their results on the analysis of these samples helping scientists understand how microgravity impacts the human body. Tingle later tested the Miniature Exercise Device-2 for providing a range of motion and resistance exercise while taking up less space aboard the station. Feustel installed new firewall gear in the Harmony module before replacing manifold bottles in the Combustion Integrated Rack. Arnold worked with commercial science hardware then processed samples for a protein crystal growth student experiment. Mice are being observed on the orbital lab today to understand the physiological signals that lead to muscle and bone loss in space. Norishige Kanai from the Japan Aerospace Exploration Agency collected blood samples from the mice to be processed, analyzed and stowed in a science freezer. Scientists are studying the effectiveness of a drug therapy to prevent those stresses and signals that cause weakened bones and muscles. 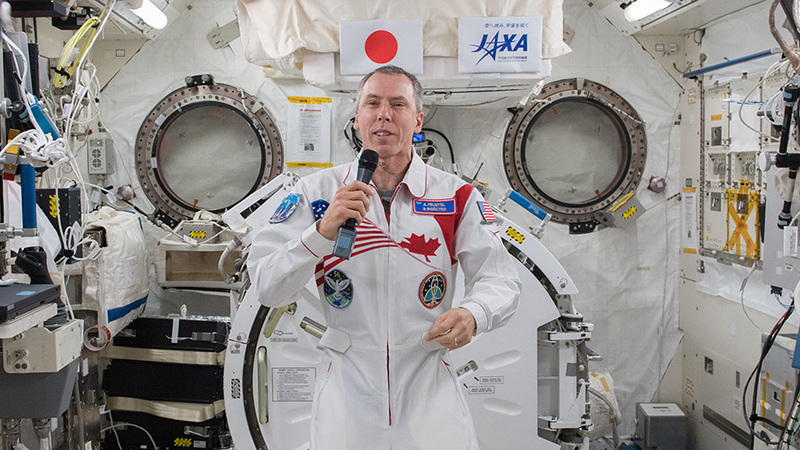 Expedition 55 Flight Engineer Drew Feustel of NASA is inside the Japanese Kibo laboratory module talking to dignitaries on Earth, including university officials, musicians and scientists, during an educational event that took place at Queen’s University in Kingston, Ontario. The space station will increase its altitude slightly when a docked Russian cargo craft automatically fires its engines for two minutes and six seconds early Wednesday. The maneuver will establish the correct orbit for the landing of three crew members in June and a two-orbit rendezvous capability for the next Russian Progress resupply craft in July. Flight Engineer Scott Tingle collected and stowed his own urine sample today for a pair of biomedical studies examining the effects of spaceflight on the human body. The U.S. Navy pilot also continued operations for the Metabolic Tracking (MT) experiment that observes how human tissue samples are impacted by a specific drug compound. Expedition 55-56 crewmates Drew Feustel and Ricky Arnold checked each other’s eyes today using optical coherence tomography gear inside the Harmony module. Feustel also installed and checked the station’s first updated printer since 2000 before wrapping up his day unloading cargo from the SpaceX Dragon cargo craft. Arnold finally collected water samples and changed out a cartridge as part of preventative maintenance on a U.S. oxygen generator. Astronaut Norishige Kanai from Japan continued more upkeep work for the Mouse Stress Defense experiment that is exploring the causes of muscle and bone loss in space. The busy flight engineer later assisted his fellow crew members unloading SpaceX cargo before injecting human tissue samples with a drug compound for the MT study.